That’s me, in the middle of the second row, proudly wearing my Brownie beanie and sash. As you can see it was early days of being a Brownie and that I didn’t have many badges. Each time my mom sewed a new badge I’d earned for learning how to do something I remember rubbing my fingers across the raised embroidery, feeling so proud of my accomplishment. It seemed to me that earning badges was something I’d done as a Girl Scout in my youth and being an adult, this time in my life was over. As an adult, I felt that badges were a simple way to giving gold stars to overly eager grown ups who had a need for external motivation. When I first began reading about Mozilla, I felt that it was just too easy to earn badges. They entice you with a small start such as earning a badge for searching? What?!? This seemed to confirm my thoughts about badges. Additionally as a teacher, I’ve shifted away from providing external rewards with my students and focused on ways to provide intrinsic motivation with my students using specific oral and written feedback. I do not use a reward system for behavior or homework. This is part of my core teaching beliefs and pedagogy. The idea of badges seemed to clash with my core educational beliefs. Then I read Carolin Escobar’s post about open badges and it opened my eyes to them in a way I’d never been before. I think a large part of that is Carolin is making a transition back to the United States after teaching overseas. I also plan to make this transition in about a year’s time. Her post helped me to see that digital badges ensure that we all speak the same language about our credentials. That all educators or even professionals in other fields can understand the skill sets that potential and current employees possess. But I had lots of learning to do. My disposition had shifted but there was still much to understand. This sent me down a rabbit hole of learning badge basics because I, as many international educators, have to explain that our work occurs at a fully accredited school and not an English language school. It’s a difficult concept for people to grasp and Carolin helped me to see that badges might be a way to bridge this conversation. With my eventual transition back to the U.S. I wondered, would having digital badges help me to more easily obtain employment? In particular the idea of having a place for all learners to make our lifelong learning pathway visible for students, their families, colleagues and other educators was exciting to me. Joyce says with open badges “We can provide people with the different paints that then they can paint their own learning experience.” How powerful is that possibility? In their discussion, my thinking was extended to consider the future of open badges. Doug shared the potential of universities and other organizations working together to develop partnerships where they build learning together through co-badging and endorsement programs. They wouldn’t then need to “reinvent the system” they could then each specialize in one portion of a badge. Jeff framed this idea as the “rebundling of education,” which is filled with possibilities but then all of the territorial logistics come into play in organizations around finances, prestige and more. Some see the value, such as found in Boise State University who’s teamed up with the National Oceanic and Atmospheric Administration and 3D Game Lab where high school students earn as they learn about the five categories of earth science. I hope other educational institutions see the value gained by a badge based approach for all of their learners, students and teachers alike. A challenge with badging in education is that currently educators measure professional growth in more traditional ways in which we show our growth including diplomas earned from universities, certificates from universities and other organizations to demonstrate proficiency or participation. 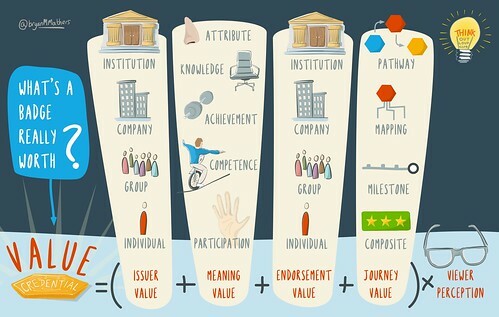 As Joyce asked, “Where do you keep your credentials?” How can we begin to shift entire educational systems including K-12 school districts both public and private, universities and colleges and professional learning centers and communities to see the value in badging? While it’s not like my Girl Scout sash of the past, I don’t need to wear it, why doesn’t demonstrating my proficiency make job placement, interviews and growth easier for those at administrative levels to see my skill proficiencies? When I was a Brownie Girl Scout, we had to say a promise at the beginning of each of our meetings. When I searched to find the original promise I was reminded that a portion of that promise included abiding by the Girl Scout Law. Rereading this law I made a connection to earning badges as an educator. This promise relates to earning badges in all aspects of our life. When we earn a badge for our work, aren’t we doing many of these things? If I’m learning a skill such as how to implement a new curricular approach to a subject area, aren’t I learning how to be responsible, helpful and use resource wisely? Earning badges is an agreement, a promise between the earner and the organization providing the badge that we can work together. Some further examples of schools and districts who are using badges to implement new learning and pedagogical approaches in their schools can be found here. These give me some hope for growth in educator based badge programs. Have you collected any digital badges? If you have, will you display those and if so how? I know there are a variety of platforms but it seems like it may be time for me to find a bridge between my faded analog Girl Scout Brownie sash of the past and my lifelong learning as an educator and I’m looking for your insights.